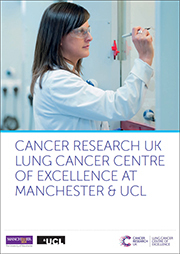 The CRUK Lung Cancer Centre of Excellence at Manchester and UCL incorporates expertise from a number of different organisations, including The University of Manchester, Cancer Research UK Manchester Institute, The Christie NHS Foundation Trust, University Hospital of South Manchester NHS Foundation Trust, Manchester Cancer Research Centre, UCL Cancer Institute, UCLH Macmillan Cancer Centre and UCLPartners. A member of the Russell Group, The University of Manchester is one of the largest universities in the UK. According to the results of the 2008 Research Assessment Exercise, the University is officially ranked best in the UK for cancer research. There are two hubs for cancer research within the University: the Faculty of Life Sciences – home to the Molecular Cancer Group – and the Faculty of Medical and Human Sciences, which encompasses the Institute of Cancer Sciences and the Manchester Pharmacy School as well as groups with expertise in cancer imaging and stem cell research. The Cancer Research UK Manchester Institute is a research institute within The University of Manchester, and is one of five research institutes core funded by Cancer Research UK. Research at the Institute spans the whole spectrum of cancer research, from programmes investigating the molecular and cellular basis of cancer to those focused on translational research and the development of novel therapeutic approaches. The Christie specialises in cancer treatment, research and education, and is the largest cancer centre in Europe. As well as treating 40,000 patients a year from across the UK, its experts have been pioneering cancer research breakthroughs for more than 100 years. The Christie serves a population of 3.2 million people across Greater Manchester and Cheshire, with 26% of patients referred from across the UK. Based in Manchester with radiotherapy centres in Oldham and Salford, The Christie is known for many world firsts, which have impacted cancer treatment on a global scale and it became the first UK centre to be officially accredited as a comprehensive cancer centre. University Hospital of South Manchester is a major acute teaching hospital trust providing services for adults and children and community services that were formerly operated by Manchester Primary Care Trust. The trust is home to the North West Lung Centre, which has an international reputation for respiratory medicine and offers specialist lung cancer services. The Manchester Cancer Research Centre was formed in 2006 by The University of Manchester, Cancer Research UK and The Christie NHS Foundation Trust. It has since been established as the cancer research arm of the Manchester Academic Health Science Centre, which is a strategic partnership between the University and six NHS Trusts across Greater Manchester. The MCRC coordinates basic, translational and clinical cancer research across its partner organisations. The Centre is also home to the MCRC Biobank, which has been set up to collect human samples from cancer patients across Greater Manchester, and the Manchester Experimental Cancer Medicine Centre. The UCL Cancer Institute was established in 2007 and is the hub for cancer research at University College London – it hosts the majority of cancer research scientists and acts as the nucleus for the UCL Cancer Research UK Centre and the UCL Experimental Cancer Medicine Centre. Particular areas of strength within the Institute include stem cell biology, immunology and immunotherapy, drug development, viral oncology and genomics and bioinformatics. The purpose built UCLH Macmillan Cancer Centre provides specialist cancer treatment to University College London Hospitals. Based at the Centre are outpatient and day care cancer services and a dedicated teenage and young adult cancer service, as well as state of the art imaging equipment, including the UK’s first PET-MR scanner. The Centre is located across the road from the UCL Cancer Institute and enables the expansion of patient orientated and translational cancer research. An academic health science partnership between higher education and NHS organisations, UCLPartners was established in 2009. It has since expanded and now covers north east and north central London as well as parts of Hertfordshire, Bedfordshire and Essex. Serving a population of six million people, UCLPartners brings together 100,000 health professionals and academics in order to translate cutting edge research and innovation into measurable health gain for patients in London and across the UK.